Body and brackets in anodized light alloy. Side motor to reduce the height. Suitable for TV up to 26". Other size on request. 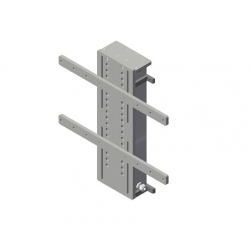 Supplied with an electronic control box for control and protection against the overloads. A remote control is available on request. It's possible, when needed, to install a movement warning device, acoustic and/or flashing. Supplied with a keyboard for the set-up and the normal use. Allows the set-up of electronic end of stroke ot your choice: that avoids the need of a very precise choice of the installation height.